Granted a royal charter by Charles I in 1632, Cecil Calvert, Lord Baltimore named the new colony in honor of King Charles' wife, Queen Henrietta Maria. 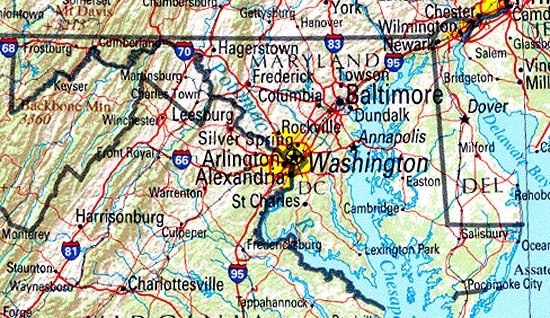 Following the Revolutionary War, Maryland ceded land to form the boundaries of the nation's new capital in Washington DC. The new nation was barely in its infancy, however, when the War of 1812 brought its old nemesis, the British, back to American soil. In their attempt to capture Baltimore, the British heavily bombarded Fort McHenry throughout the day and night of September 13, 1814 when "the rockets red glare" inspired the famous lyrics to America's national anthem, The Star Spangled Banner. For more fun in the sun, a day trip to Assateague Island National Seashore is a nature lover's paradise with its unspoiled sand dunes and protected herds of wild horses! at Ocean City (pictured) and Chesapeake Bay, and tours of historic Annapolis (right). In Baltimore, top family-friendly attractions include the National Aquarium and the Maryland Science Center at Baltimore's Inner Harbor. For toddlers and younger kids, Port Discovery also offers wonderful activities and a chance to become part of the action at unique exhibits covering American history, science and pop culture. More history is on display at the Babe Ruth Birthplace and Museum, a mecca for baseball fans of all ages. Or, spend a sunny afternoon outdoors at Baltimore's Cylburn Arboretum for walks around the nature preserve featuring family-friendly activities and demonstrations throughout the year. • Located at Swallow Falls State Park near Oakland, Muddy Creek Falls measures 63 feet high and is the state's largest waterfall. • Built in the mid-19th century, an acorn-shaped gazebo can be found in Acorn Park in Silver Spring. • With downtown lined with many small shops specializing in the sale of antiques, New Market is known as Maryland's antique capital. • Many of the famous people born in Maryland include Yankee slugger Babe Ruth, rocker Frank Zappa, blues singer Billie Holiday, and author Upton Sinclair. Maryland Tourism - The official site featuring info on hotels & accommodations, restaurants, major tourist attractions, pictures, video clips, guides to cities and towns, historical background, kids activities, FAQ's, weather info, event calendar. Baltimore.org - Check out neighborhood guides, pictures, fun facts, plus useful info on hotels and restaurants, getting around, major attractions, seasonal events. Ocean City Maryland Chamber of Commerce - Maryland by the sea - with beach guides, events and activities, hotels, restaurants, driving directions, pictures, Ocean City maps, calendar of events, FAQ.